...kind of underwhelming just now. I slept fine last night, didn't wake up with a burst of adrenaline, and I'm not bouncing off the walls right now. But I get the impression I'm the exception rather than the rule. The boys are out for a jog just now near our hotel. 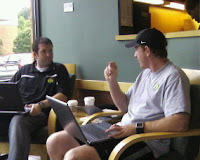 I'm at a local Starbucks with the braintrust, who you see in the photo there. It's a rather mundane setting, I agree, but I think it captures that we're still over 8 hours from game time, and a trick is not to expend too much emotional energy too soon. Sounds like the plan today is to just lay low and get ready. Once we get some food, I'm going to corner a few players and get some interviews for the pregame show. Certainly all of the guys named to the all-league teams yesterday. It's overcast now in Atlanta, temperature probably around 65 or 70 degrees. Still a bit humid, but not that uncomfortable. By the time we reach 8 pm, I don't think the weather will play any factor in the game, unless we get some rain, of which there's a 20% chance. But it certainly won't be the hot, swealtering type stuff you fear when you come to the south.